Cochise Ridge is a gated community offering a beautiful natural setting with striking mountain views. It is located next to the Cochise Golf Course with easy access to all of the dining and events at the Cochise-Geronimo clubhouse. Most of the homes in Cochise Ridge were built between 1995-1996 and are 3000-4000 square feet. Living in one of North Scottsdale’s premier communities has its benefits. All Desert Mountain members have access to the great amenities of the community. Desert Mountain is very well known for its superior golf courses. There are six different courses, all of which were designed by Jack Nicklaus. Throughout his golfing career, he designed strategic courses with beautiful landscapes. Desert Mountain Golf Club has won many awards and is highly regarded. Desert Mountain caters to many different other interests besides golf. The Ranch at Desert Mountain is a 33-acre property on the edge of the Tonto National Forest. It offers guided horseback rides, horse riding lessons and luxury camping. Camp out in luxury tents with redwood floors, hot showers and chef-prepared meals while experiencing Arizona’s beautiful nature. The Ranch also has 15 miles of private trails for hiking, ranging in difficulty. The Ranch is perfect for family gatherings with ramadas and picnic areas against the picturesque mountains. Desert Mountain’s spa and fitness center is available for you to pamper yourself. Take up tennis and play at Desert Mountain’s impressive tennis complex with your choice of grass, clay or hard surface courts. The Sonoran Clubhouse has lap pools, volleyball courts and a basketball court for all of your sporting needs. Desert Mountain is a community like no other. It has everything you want and more, conveniently located in North Scottsdale. There are 32 different gated villages within Desert Mountain. 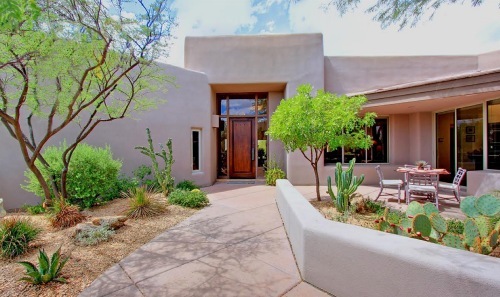 If you would like to view real estate in Desert Mountain, call Carmen Brodeur at (602) 791-0536 or email Carmen@TopScottsdaleHomes.com to schedule a showing.